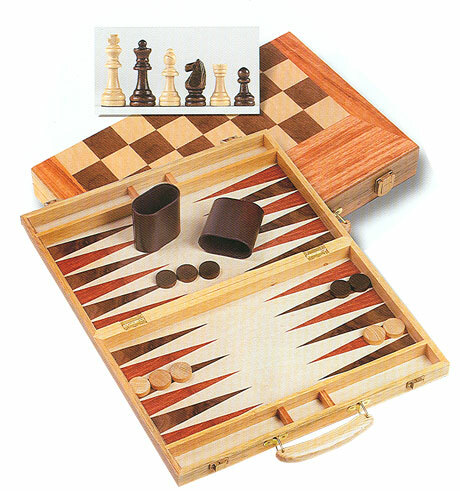 Gamester Backgammon/Chess Sets (#415) – This two-in-one Backgammon and Chess Set features an inlaid wood folding carry case with solid brass latches. The set comes complete with weighted and felted Wood Chess Pieces (King measures 3" tall), Wood Checkers, 4 Dice, a Doubler, and 2 leatherette Dice Cups. The size is 15" by 9.5" when closed. 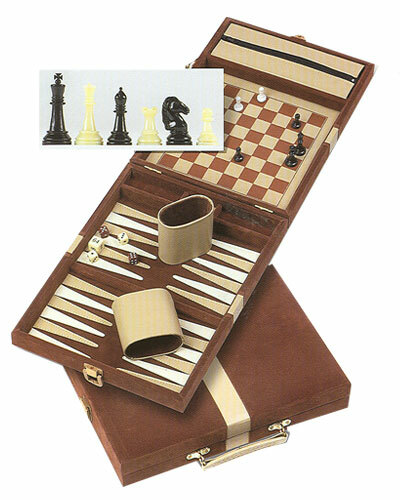 Magnetic Attache Game Set (#417) – This three-in-one Backgammon, Checkers, and Chess Set features a handsome, mocha-colored velour carry case with solid brass hardware. The set comes complete with magnetic chess, checkers, and backgammon, two matching dice cups, 4 dice, and a doubler. The size of the case is 12-1/4" by 9" when closed.